I first fell in love with Felicity Montague in The Gentleman’s Guide to Vice and Virtue, so imagine my delight when I heard she was to have her own book! 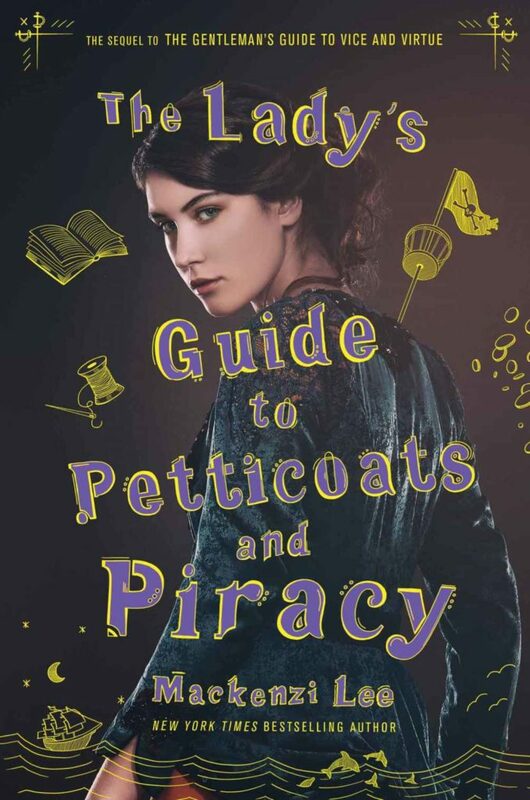 The Lady’s Guide to Petticoats and Piracy has all the elements I’ve come to expect from Mackenzi Lee—adventure, a richly diverse cast of characters and some laugh-out-loud humour—interwoven with a touch of magic. More than this, though, it’s a story about three incredible young women struggling to find their place in a world ruled over and dictated by men. Before the rift that tore them apart, Johanna Hoffman was Felicity’s closest friend. They would spend hours playing at being explorers in the woods around their childhood homes, heedless of muddying their skirts. Now, Johanna is everything Felicity despises—powdered and primped and every inch a lady. Yet, when circumstances reunite the pair, Felicity begins to see beyond the frills and pretty manners. It could be that the girl she adored, the one with the adventurous spirit and compassion for animals, is not as lost to her as she feared. In contrast to Johanna, Sim Aldajah is a born pirate—fierce and brave but with a heart of gold. Eldest child to the commodore of the Crown and Cleaver, she dreams of inheriting the fleet from her father, and is determined to prove herself worthier than her younger brothers, even if it means tricking her way into and stealing from the Hoffman household. Felicity is drawn to Sim, despite the initial mistrust between them, and as their bond develops, she helps the other girl to realise their might be more to life than following in her father’s footsteps. But Felicity is perhaps the most stubborn and ambitious of the trio. Pricklier than a cactus, single-minded to a fault, she will go to any lengths to overcome the barriers posed by her gender and train to be a doctor. The last thing she anticipates is that her ambition will lead her on a journey across Europe and beyond, or that she will become caught up in the quest for a sea monster with magical properties. Still, with the friendship and support of Johanna and Sim, it may be that she can achieve her goal in ways she never imagined. I came to admire all three of these extraordinary young women, and found their individual efforts to carve out a unique path for themselves truly inspirational. The fact that they’re each so different makes for some feisty and often hilarious exchanges, and Felicity’s lack of social skills had me in stiches. I also enjoyed the subtlety with which Felicity explores her asexuality, discovering that while she experiences no physical desire, she does possess an enormous capacity for love. For a light-hearted read packed with excitement and clever twists, and one of the best heroines I’ve come across in a long time, The Lady’s Guide to Petticoats and Piracy by Mackenzi Lee gets 10/10 rainbows. Mackenzi Lee holds a BA in history and an MFA in writing for children and young adults from Simmons College. She is the New York Times bestselling author of the historical fantasy novels This Monstrous Thing, The Gentleman’s Guide to Vice and Virtue, which won a 2018 Stonewall Honor Award and the New England Book Award, and its sequel, The Lady’s Guide to Petticoats and Piracy, which debuted at #3 on the New York Times bestseller list. She is also the author of Bygone Badass Broads, a collection of short biographies of amazing women from history you probably don’t know about but definitely should, based on her popular twitter series of the same name.